If there is one thing I need to see on the Reputation tour it’s Taylor bringing out Cobie Smulders aka Robin from How I Met Your Mother. If anyone has ever seen HIMYM, then you’re familiar with the iconic hit, Let’s Got To The Mall. I would absolutely LOVE to see this, it would be so amazing! (note: *spoilers for those who have yet to see HIMYM but are curious as to why this was a thing- It was from Robin’s popstar teen years in the show). When I was thinking back to 1989 tour I remembered Taylor has brought out Lisa Kudrow aka Phoebe Buffay to perform her song from Friends, Smelly Cat. So I mean lets have another iconic tv song performance right? 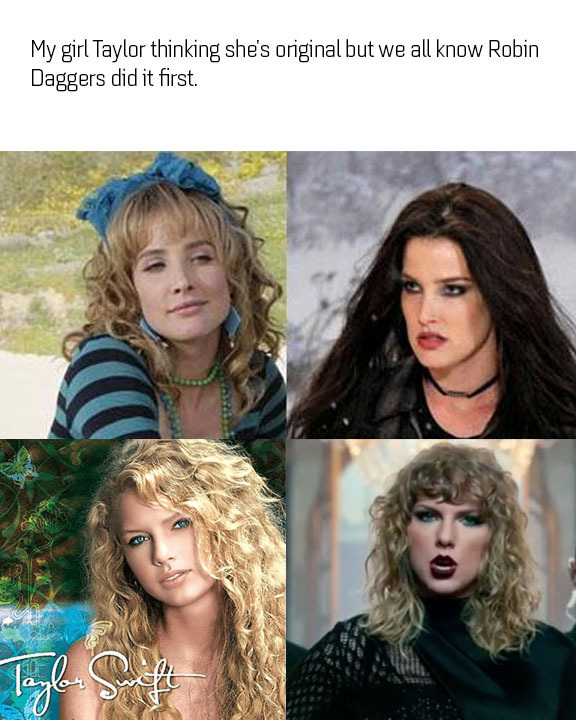 Funny enough when I was looking up to make sure my idea was not already something she’s done, I saw a LOT of comparison articles saying how Taylor’s transition from 1989 to Reputation was just like Robin Sparkles to Robin Daggers.